Sharks kill about 6 people a year, but hippos kill 300! This mug has an adorable, but deadly, hippo that will sit just below the surface of your coffee waiting for you to reveal its gaping maw. Also good for your kid's milk - it will teach them what animals they really need to fear. 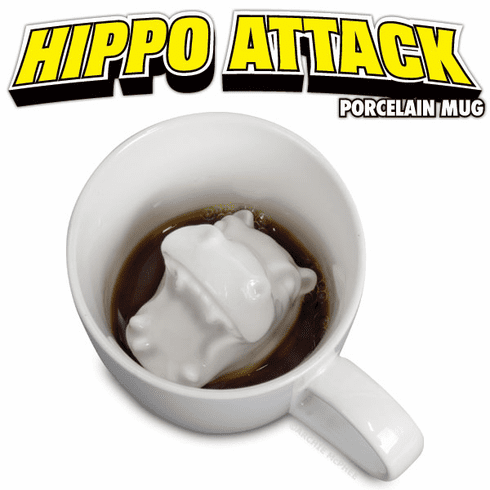 The Hippo Attack Mug is a 3-1/4" (8.3 cm) tall porcelain mug with a hippo head on the bottom. Holds 7 fl. oz. (207 mL). Dishwasher and microwave safe.